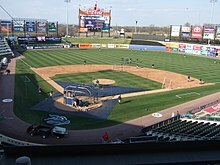 ^ "General History | MiLB.com History | The Official Site of Minor League Baseball". MiLB.com. Retrieved 2018-09-19. ^ "25-Man Roster". Major League Baseball. Retrieved 2018-09-15. ^ Babb, Kent. "Baseball's minor leaguers pursue their dreams below the poverty line". WashingtonPost.com. The Washington Post. Retrieved 8 September 2016. ^ Rivera, Joe. "Minor League Baseball hires first female umpire since 2007". Sporting News. Retrieved 22 June 2016. This page was last edited on 15 April 2019, at 08:26 (UTC).